The shocking success of Donald Trump and the Republican Party in this month’s election prompted political science professor William Howell to give up his sabbatical and return to the classroom to teach a class on the American presidency. Howell also wrote an op-ed for CNN noting the irony in a candidate running on the premise that the American electoral system was “rigged” ultimately coming into power without a popular vote plurality. The Maroon sat down with Howell to discuss his decision, his new class, and the prospect of executive power in a Trump presidency. 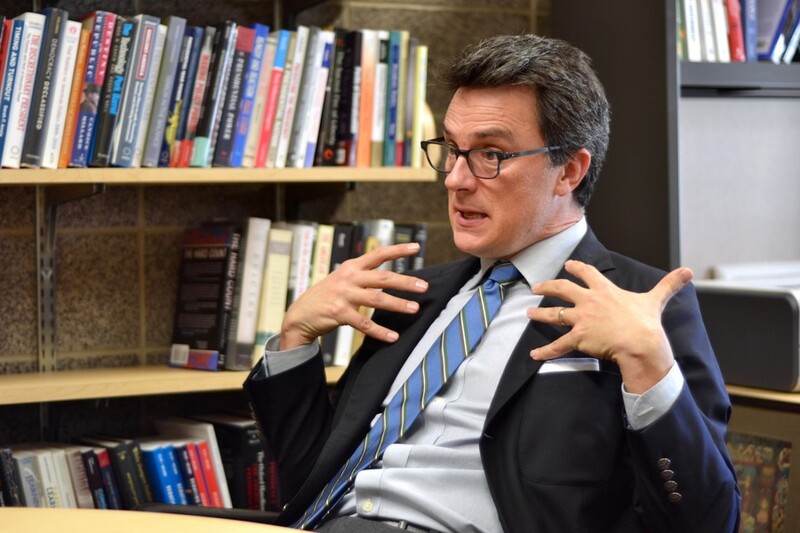 Howell is the Sydney Stein Professor in American Politics at the Harris School of Public Policy and a professor in the Department of Political Science and the College. Chicago Maroon: Thank you for joining us. First, I wanted to say welcome back from your sabbatical. Many on campus were saying you left your sabbatical after the election results. What brought you to that decision and what were you doing on your sabbatical? Professor William Howell: Well, the last sabbatical I had was seven years ago when I went off to Stanford and wrote this book, The Wartime President. This sabbatical, I had an idea—and I still have an idea—for an altogether new project about the politics of information and surveillance. Those are questions and interests that I continue to harbor and want to continue to pursue. But, the enormity of this election, emotionally and intellectually, and the immediacy of this election made me want to return to the University and to teach again. To get back into the classroom, to try as best I could to make sense of what awaits us. I think there’s some big profound questions that await the country about whether or not this institution is going to discipline this man. What it means to have a president like Trump entering into a system of separated powers. This class on the American presidency can speak to [that], and I’m eager to enter in to conversation with students. I didn’t want to wait a year to do that. I wanted to be able to process these issues in shared conversation with students. CM: So your class next quarter, “The American Presidency”—what’s going to be the main focus of the class and how is the class going to be different than if you were to teach it last year? WH: The class is going to focus on issues of power, issues of governance, issues of institutional design, which to my mind are central to understanding the significance of his election. The class is not going to focus on how it came to be that a country elected Trump. And it isn’t going to focus on primaries, general elections, voting patterns in presidential elections and how they compare to congressional elections. It’s not a class on political behavior, it’s a class on political institutions and the office of the presidency. But I think it's going to also ask…it’s going to provide a venue in which we can reckon with this historical moment, because I think we are in a real historical moment. And it’s a historical moment that’s overwhelming. It operates on lots of levels. I think a lot of people are afraid. I think there is a lot of bigotry that has not just been legitimated but is ascendent that we need to come to terms with. Come to terms with not just in its own right, but try to understand the significance of it for our politics. I think there are ways in which the kinds of institutions that we’re accustomed to—the press, and the way it disciplines political actors, civic organizations, parties—have been and will continue to be challenged in foundational ways by this man, by his campaign, and by the kind of populist sentiments that he has aroused. So, to my mind, it’s not just about understanding the presidency because that’s something important for us to understand as political observers, it’s understanding the presidency because it provides a lense for us to understand this historical moment. And I’m hoping we can come together and do that. CM: How do you think campus will change under Trump’s presidency? How will educational experiences be impacted? WH: First, let me say, it won’t be impacted. Insofar as we’re a private institution, an elite institution, a wealthy institution. We have lots of protections against the kinds of passions that have been stirred up. We have deep commitments to open and free inquiry that the University leadership has reaffirmed. We came here because we believe deeply in free and open inquiry, and I continue to believe that will persist. We are not beholden to a state legislature that public universities are and we have a sizable endowment...so we play from a position of strength in ways that other institutions do not. On the other hand, I think that students at the University are struggling to try to understand what just happened and are asking foundational questions about what it means to lead a meaningful life in an era in which the kinds of basic values that they hold dear have not just been challenged, but to many of their minds, have been defiled. They have been soiled. They have been degraded. There’s a way in which, to my mind, whatever your life pursuits are—be they entering into politics and going to lots of seminars at the IOP or working in the humanities or working in the sciences—there’s a newfound meaning to be had in that work, that is given newfound urgency in a world in which questions raised about importance of truth have been raised, questions on free and open inquiry, questions have been raised about the idea that we should respect one another and recognize the humanity in one another. A lot of people over the course of this campaign couldn't wait to get to Election Day because there was a sense in which there was going to be a turn. Not just the negativity, but the ways in which the left and the right lost their way. There was going to be a restoration once we got past this election. For many people that didn’t happen. Many people on the left, many centrists, and to my mind, many principled Republicans feel like all that they feared about the Trump presidency have been legitimated and could well be institutionalized. So conversations that we’re going to have going forward on campus involving issues of race, inequality, class, urban versus rural divides, are going to be challenged and given new urgency. They could be coarsened. But there’s a way in which I think this event was a total event. I mean, it works on so many different levels and it’s going to work on so many levels in this privileged, great institution we have. CM: How do you think Donald Trump will transform the office of the presidency in the way that it functions? WH: This is a great question. I just want to affirm the question. We should be asking this question. So I write about the American presidency, and I am accustomed to thinking in institutional terms. I am accustomed to saying that if you want to make sense of the decisions that are made, the platforms that are argued on behalf of presidents, you should study and scrutinize the design of the institution [and] think about how it interacts with Congress and the courts and international organizations and the bureaucracy and interest groups the press. There is an institutional story to be told here, and that story is still to be told with a Trump presidency. In the same way that the media was reeling from revelations in the aftermath of the Iraq war, that there were not in fact weapons of mass destruction, that maybe the media should have been doing something more vigorous in scrutinizing a sitting president. And here too, should they have been doing something other than presenting over and over again what the predicted probability of what a Trump presidency would be. The amount of resources, attention, and energy was paid to that. There are two big institutions— the party and the media—that are reeling in his wake. He’s about to assume the office. We’ll see. CM: In your piece on CNN, you discuss how things may or may not change in the future in regards to the Electoral College. What do you think Hillary Clinton’s winning the popular vote does to Trump’s presidential mandate? WH: Well, it takes it away, to the extent that a mandate is born out of the will of the people. And the will of the people is best experienced through a popular vote. He doesn’t have much of a platform on which to argue in terms of a mandate. In that piece, I was also trying to highlight the irony of all of this, that he presented himself not just as a populist, but as an insurgent populist, one who hasn’t been sullied by politics and one that stood for the interest of average citizens in taking the fight to a rigged political system. He says it again and again—our politics are rigged. What does he mean by that? It’s that the will of the people are subverted in our politics. So again and again, the example he would use is that people will come and vote, and those votes won’t be counted. Or certain people who have no business voting will vote, and they will vote repeatedly. And in that sense, the votes that we cast and the electoral outcomes that we observe will not reflect the will of the people. There’s great irony that the institution that since day one of the republic has most consistently subverted or distorted what the will of the people is, is the Electoral College, which puts disproportional weights on small states…. Because it's a winner-take-all system state by state, you can get big swings, it often exaggerates what the popular vote differential is, and in some cases—this isn’t the first time—the person who wins the popular vote does not win the Electoral College vote. That institution, that reliably distorts the popular will came to the rescue of the very individual who ran on a platform of being against this rigged political system, and that’s worth recognizing. “The more you undermine trust and belief in institutions, the more you undermine people’s idea that what policy makers are saying has evidential basis…it undermines the basis for the system itself."